The 15-metre Swedish-ESO Submillimeter Telescope (SEST) at ESO's La Silla observing site in the southern part of the Atacama desert of Chile. This cool space wallpaper shows 15-metre Swedish-ESO Submillimeter Telescope (SEST) at ESO's La Silla observing site in the southern part of the Atacama desert of Chile. Designed to observe at sub-millimetric wavelengths, SEST was built in 1987 on La Silla and decommissioned in 2003. 2400 metres above sea level, La Silla was ESO's first observing site. 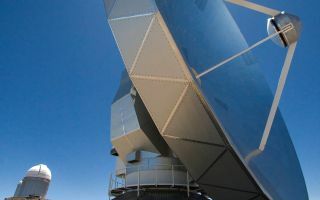 Currently La Silla hosts ESO's 3.6-m telescope, the New Technology Telescope (NTT), and the 2.2-m Max-Planck-ESO telescope.